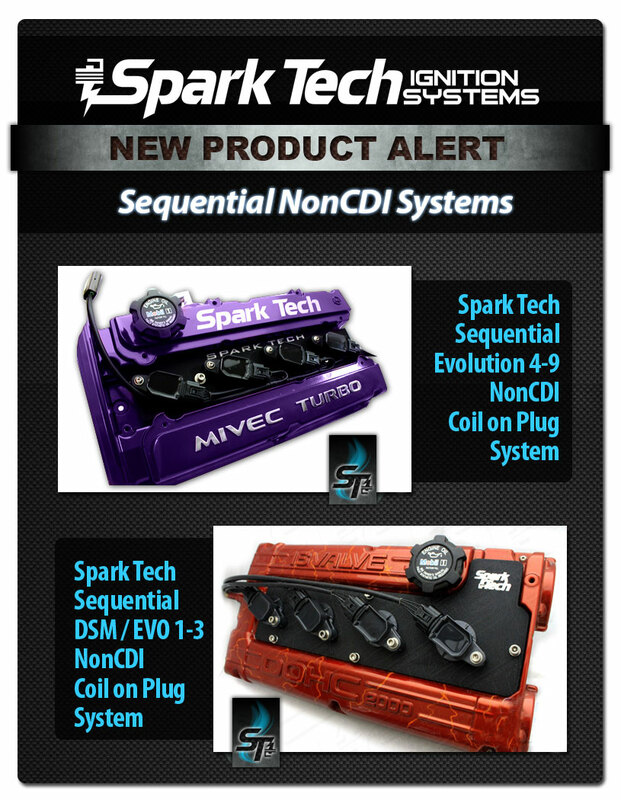 We are pleased to offer the first and only Spark Tech NonCDI Sequential Ignition System, designed right here at S/T. This system is standalone ecu compatible ONLY as it requires 4 individual Ignition outputs/channels. It converts your Ignition system's function from wasted spark to Sequential. Here is a brief explanation of how it works. The factory Evo 1-9 (Evo X uses Sequential Ignition) ecu has 2 channels/outputs - a wasted spark system. One cylinder is firing on the exhaust stroke and one on the TDC of the compression stroke. Cylinders 1 & 4 and Cyl 2 & 3 fire/spark simultaneously hence the name wasted spark. Enter Sequential Ignition....only 1 cylinder/coil fires at a time and only when needed. This gives the other coil extra charge time hence increasing spark intensity and consistency. Since it is not firing when it is not needed it also runs cooler thus increasing coil life. Over the years we have been fortunate to work closely with a few Top shops in the Evolution market here in the U.S and around the World. This time we had the pleasure of working with Reese Tuning located in Santee, California and Captain Marck Carey with his Time Attack car in Jamaica. One look at Reese's ultra clean crisp running RS should disperse any doubts. 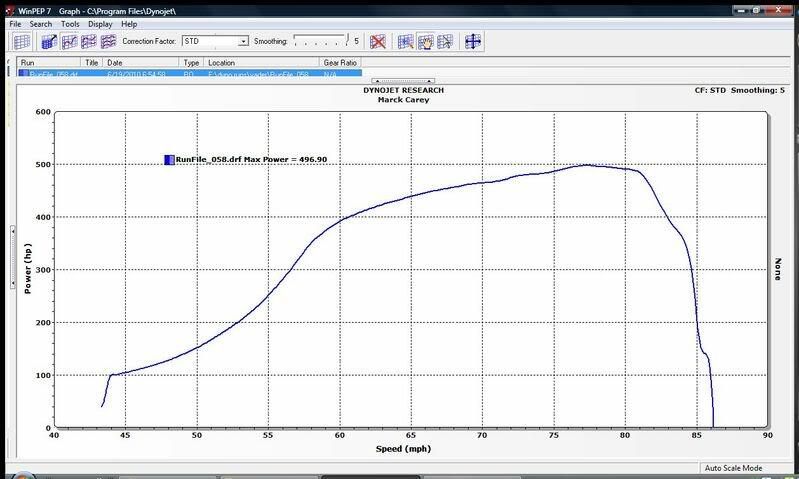 If you still have your doubts take a look at his recent dyno graph utilizing our NonCDI Sequential system. Man does this baby belch out some usable Horsepower and Torque. Reese Tuning is an authorized S/T dealer with the knowledge and expertise and we highly recommend them for your install and tuning of this product. Marck built his own tube chassis at home and is a privateer. A true car enthusiast, a die hard mitsubishi fan and no stranger to horsepower, as his daily driver is an airbus A320! 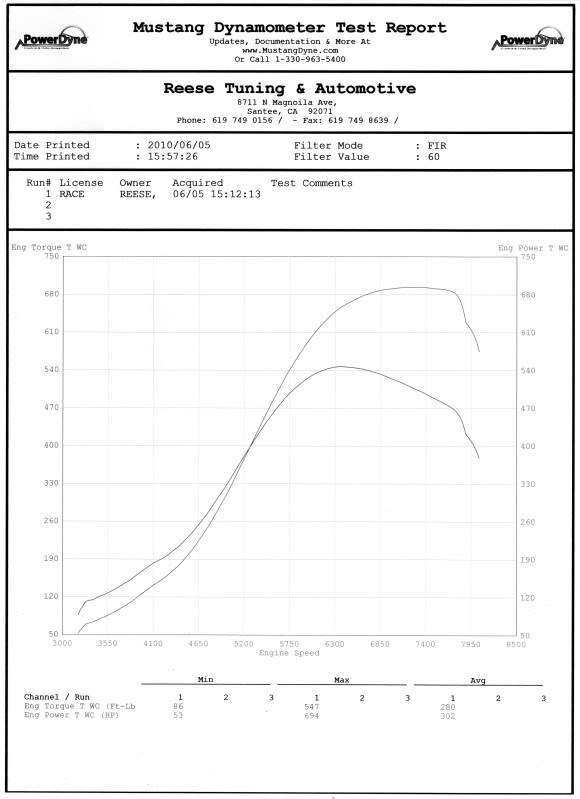 With the Spark Tech NonCDI Sequential system installed he was able to put down 497whp out of a 1.6 motor, on a conservative tune for time attack. We want to take you through a brief explanation of the design criteria that must be met before a system is released to the public. Assuring you we are not playing a guessing game with your money. First and foremost a new system must do what it was designed to do or the concept goes no further (and yes we do have some designs that didn't make the cut). After the feasibility and performance goals are met on paper a beta system is created and tested here at our facility. Once it has met our standards a tuner/builder is chosen with enough experience to sufficiently test the system in it's intended parameters. We get direct feedback on the following. 1. Performance...did it work as intended? 2. Level of difficulty to install...can something be changed to facilitate a quicker or neater install ? 3. Drive-ability...is there a noticeable difference?. 4. Repeated testing many miles of testing in cold and hot weather. Ensuring you the customer that the product will work in your climate. After this testing is done. We then do any revisions if needed. This process normally takes 6months or even longer. Finally we'd like to give a shout out to a couple of people that have also made this possible. The guys at English Racing (thanks Lucas and team) and my good friend Brandon (itzwolf here on evo m). Brandon's car was used as an initial test bed and he can tell you we made several trips up to Jacksonville to work the bugs out of the initial design. Wow, has time flown! That was 9 months ago already. Brandon's beast belches out 600whp on pump gas and is fully built with an AMS 2.0 along with supporting mods and an AEM ecu. PS. - When should I send you that valve cover? Congratulations on the release Craig and thanks for the shout out! Instantly when this system was on my car I noticed a very nice crisp feeling that was unlike anything I've felt on an Evo. I was running stock coils at the time when we switched the car to this sequential setup for testing. Like Craig mentioned several trips to Jacksonville for him and I made a trip to Daytona to iron out any bugs and AEM quirks to ensure all the correct settings were achieved. I ran this system on my car for a few months to ensure it was solid and it never let me down, I literally daily drove the car during this time and put an easy few thousand miles on the system in that short time. I also have a SparkTech Pro CDI system and this non-cdi worked just as good as that system even without the CDI box being that the wasted spark is eliminated. I was really temped to switch over to this over the Pro unit. The car had extremely well mannered low speed drive-ability even in low gears and didn't disappoint at all running 30psi on pump gas, even with a relatively large plug gap since I do have a CDI system and the plugs were gapped for that. As always, another solid option from SparkTech!! Last edited by itzwolf; Jul 10, 2010 at 12:18 AM. So how much would one go for shipped to 79764......? Awesome - keep up the innovation guys!! Last edited by SLVRNBLK; Jul 10, 2010 at 03:04 PM. Thank you It was a pleasure working with you. I truly appreciate all you went thru to help us out. Guys in the initial setup, we were trying to start the car it was like 2 am and it made a helluva back fire....woke the whole neighborhood up. Needless to say that was the end of testing for that night...but there were more. On another trip up to Brandon we got all the ducks in a row and she fired right up. I enjoyed helping with this development and I'm game for any future developments as well. I got someone still inquiring about that other platform we talked about during the development of this system. May even have an additional person who would want one also. Both are bad *** cars I am tuning and I can give you full details later. That backfire was cruicial! Luckily no one came running out with guns blazing or called the cops that night. I enjoyed helping with this development and I'm game for any future developments as well. I got someone still inquiring about that other platform we talked about during the development of this system. Most definitely going to get going on that project. However i've got a couple more releases lined up prior to that one. It's definitely on the radar thou. When we do you will be involved. Factory coil cover fits right over the top of these for those of us that like to be sneaky.